JUBILEE Square was buzzing with excitement and anticipation on Thursday as the crowds poured in for another Woking Shopping extravaganza to celebrate the annual Christmas lights switch on. The event kicked off at 2pm with pukka performances by local groups from Brookwood Primary School, West Byfleet Infant and Junior School, Chobham Theatre, Woking High School Band, Flipside Dance and Summerscales. Popular children’s entertainers The Octonauts were a big hit too when they met fans face-to-face in the square and Peacocks shopping centre. Also mingling with the crowds were Father Christmas, Bjorn the Bear, Jack’s of Frost, the Light stilt Walkers and the Christmas Meanderthals, meeting and greeting punters as they made their way around. Later the entertainers took to the stage, creating squeals of delight, along with another favourite, CBeebie’s Mr Bloom and some of his allotment props. 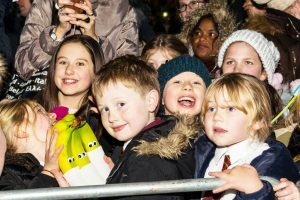 Pop artist Thomas Teago delighted visitors with his performance, with support from former multi-platinum selling N-Dubz’ Fazer, before film, theatre and TV star favourite Warwick Davis took to the stage. 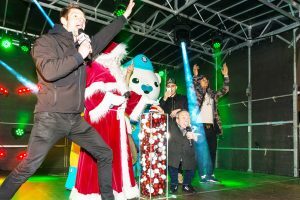 Eagle Radio, Santa, The Octonauts, Thomas and Fazer helped Warwick and the crowds count down to the lights switch on, which triggered a burst of streamers and artificial snow. Bradford-based rising artist Thomas Teago was wowed by his first ever visit to Woking. WARWICK will be starring as Prof in this year’s panto in Woking’s New Victoria Theatre, Snow White & the Seven Dwarfs (Saturday 10 December until Sunday 8 January 2017: visit www.theatresonline.com/woking to find out more).